About 200 people on the Edgware Road are celebrating the apparent downfall of Colonel Gaddafi after Libyan rebels entered Tripoli. A video of people dancing and chanting has emerged thanks to LBC Radio’s Dan Freedman. One person on Twitter claims that the celebrating crowds include a small child brandishing a plastic toy gun, echoing the scenes that Sky News has been broadcasting live from Tripoli. The news network’s reporter on the ground in Tripoli, Alex Crawford, captured astonishing footage of rebels celebrating on Green Square, including Kalashnikov rifles being fired at symbols of Gaddafi’s government and up into the air. 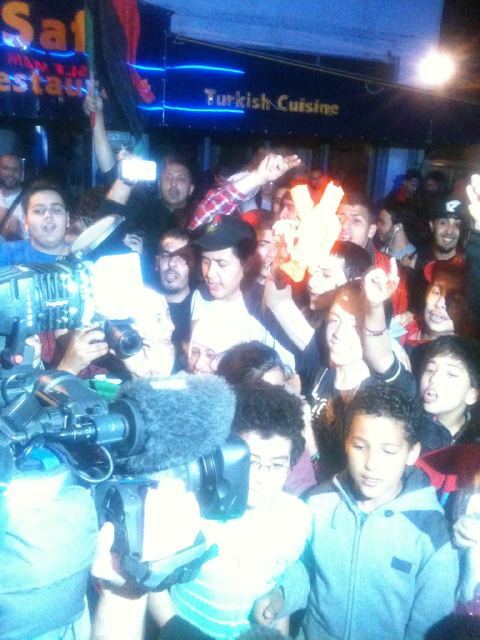 Crowds of pro-Libyan supporters remain on the Edgware Road at the time of writing. It is not known how long they intend to stay there but news crews are in the area at the moment. In Libya itself Saif al-Islam Gaddafi, one of Colonel Muammar Gaddafi’s sons, has been arrested and will be sent to the International Criminal Court at The Hague. Mohammed Gaddafi, another of Muammar’s sons who runs the Libyan Olympic Committee, is also reportedly under house arrest. Gunshots were heard whilst he was giving a telephone interview to an Arabic channel but he appears to be unharmed.